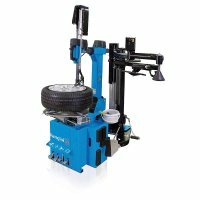 This RAV tilt-back tire machine offers the strength and rigidity of the tiltback design in a high performance package. Available Slivo quick-change kit allows you to convert the machine from lever action to no-lever action and back again in only a couple of minutes. The tilt back design has been popular for over 30 years due to its strength and lack of flex under pressure. 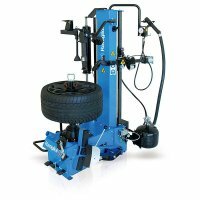 In comparison to the swing arm style tire changer design it is also easier to set up as it spaces the tool away from the wheel semi-automatically. 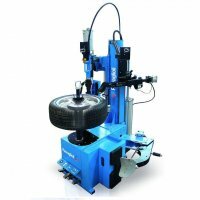 This version is truly geared for high performance and high volume with its 220v variable speed drive, powerful 8000psi bead breaker, and 26" outside clamping capability. For added versatility please consider the Slivo quick change option which allows quick conversions from lever to no-lever action. Difficult tire changing becomes a 1 person operation. External Clamping 8" - 30"
Internal Clamping 10" - 34"
Call 1-877-RING-AET for special pricing on floor models and demo units today!